Flinto makes it quick and easy to create prototypes that look just like the real thing. And Flinto doesn’t disrupt your current workflow because it uses the screens you’ve already designed. 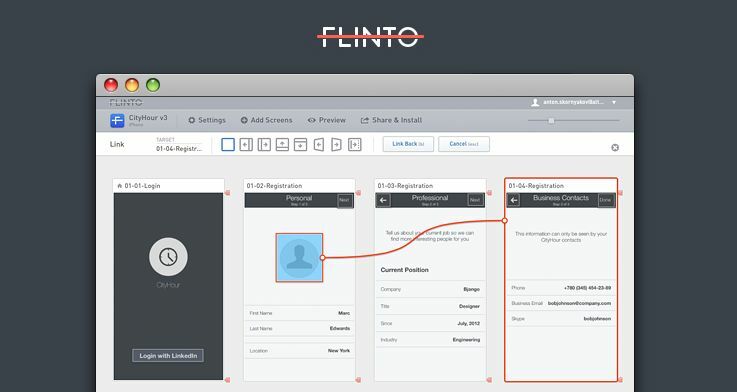 Read on to learn how Flinto works. Link your screen designs together in a completely visual, intuitive way. You might even say it’s fun. Iterate by dragging new screens on top of old ones. Screen gets replaced, links stay put. Hold option while hovering over a screen and links are drawn automatically.